News from George Wingfield, Jr.
Am home again on a week’s leave and while I’ve been away, new orders to Naval War College, Newport, R.I. came thru, so shortly I’ll be leaving S.D. in time to get there by 1 July for a 5 month course in tactics, strategy, etc. – then a staff job somewhere. Expect to stay in Chicago 2 or 3 days with my mother Mrs. Paul D. Hamlin, 1301 Astor Street, sometime between the 22 – and – 27th. In case you have a local phone number eave your number there for me. She’s in the book. [page 2] are still “put.” Jim Gardiner called me when he returned. He’s with the Marines near San Diego. Got registered while I am home as otherwise I couldn’t have voted in the coming election – and I did want to offset a good new deal vote with mine – and will! Feel great and the fishing is good. I’m ready to lick bears or Newport socialites – come what may. 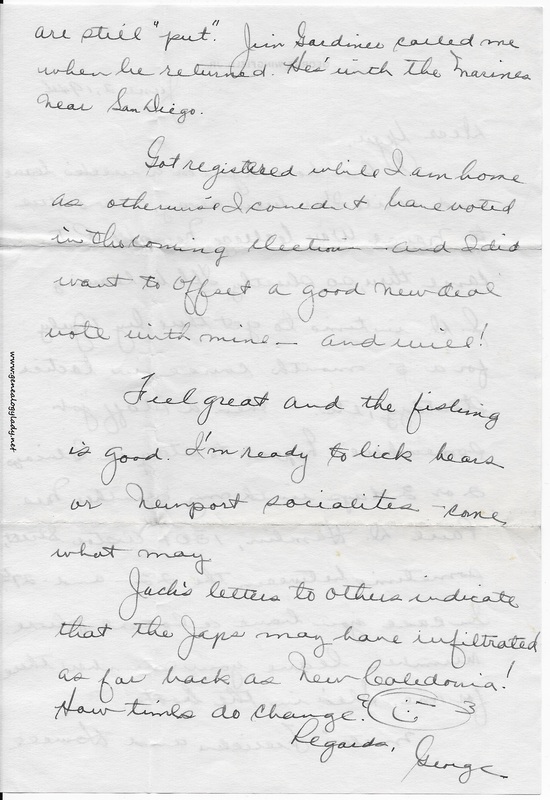 Jack’s letters to others indicate that the Japs may have infiltrated as far back as New Caledonia! How times do change. 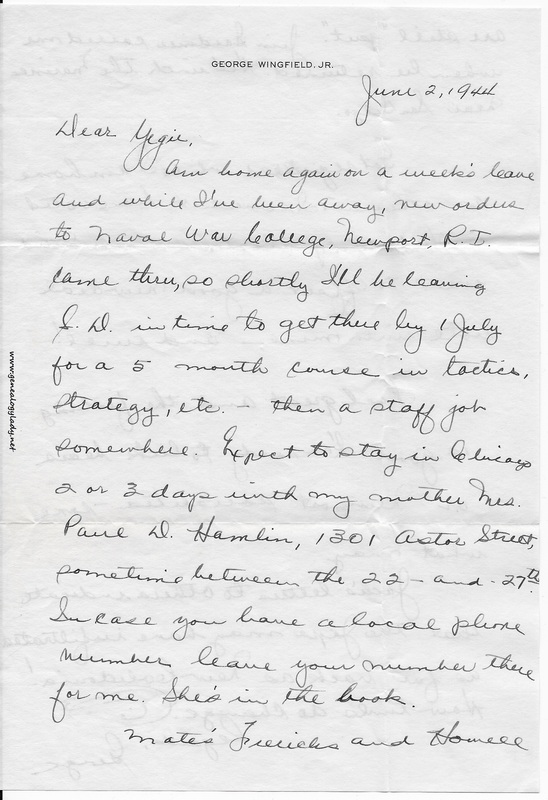 This entry was posted in Foster, Genealogy, World War II, World War II Letters, Yegerlehner and tagged Commander Frericks, genealogy, George Wingfield Jr., Lt. Commander Jack M. Howell, Lt. James W. Gardiner DC, Maude (Murdoch) Wingfield Hamlin, Mrs. Paul D. Hamlin, Naval War College (Newport), New Caledonia, Pacific Theatre, Roscoe S. Yegerlehner, United States Naval Reserve, World War II, World War II letters on February 22, 2016 by Deborah Sweeney. “I did want to offset a good new deal vote with mine – and will!.” I suspect that my father was against Roosevelt as well.